Chaminade Resort & Spa is hosting the First Annual Santa Cruz Concours D'Elegance at Chaminade Resort & Spa September 3-5, 2010. Set in the mountains overlooking the Monterey Bay and surrounded by ideal cruising roads, the event's world-class cars, including masterpieces from Canepa Design, will benefit Children's Hospice and Palliative Care Coalition (CHPCC). Concours entrants will have the opportunity to participate in an Ultimate Driving Tour that will take selected rare and historic cars on a drive for a scenic tour of area. In addition to the beautiful cars displayed on the 300 acre property, the Santa Cruz Concours D'Elegance will feature a number of activities, including live and silent auctions and a "Lifestyles of Santa Cruz" fashion show presented by Yvonne's of Capitola. The Santa Cruz Concours awards dinner will take place on Saturday, the 4th. The awards dinner has limited seating, and reservations will be accepted on a first come first serve basis. Tickets for a raffle will be available Friday and Saturday and the prize will be a Corvette Convertible donated by Ocean Speedway. CHPCC is an organization dedicated to improving care for children with life-threatening conditions. Through CHPCC's direct efforts, the federal government has approved a pediatric hospice eligibility waiver, dramatically changing the way in which seriously ill children are cared for in California. CHPCC is in the process of establishing offices in 13 California counties including Santa Cruz and Monterey. Packages for the Santa Cruz Concourse D'Elegance weekend are available. One will include vehicle registration, 2 room nights and tickets to the awards dinner. 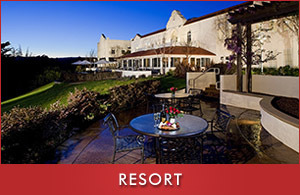 More information on additional packages is available at the Chaminade Resort & Spa website. To learn more about sponsorship opportunities or registration for Santa Cruz's First Annual Concours D'Elegance at Chaminade Resort & Spa, visit www.santacruzconcours.com or www.Chaminade.com or call 831-475-5600. Yosemite Sierra Visitors Bureau Announces . . .
Crews are busy at work getting ready for the spring opening of the Yosemite Mountain Sugar Pine Railroad. Starting it�s 44th year of operation, Yosemite Mountain Sugar Pine Railroad is a fixture in the region. Running on a segment of railbed used by the Madera Sugar Pine Lumber Company from 1899 to 1931 as over 500,000 million board feet of lumber were harvested from what is now the Sierra National Forest. Two vintage Shay steam locomotives were restored and now give visitors all the sights, sounds and more of old world, steam-powered transportation. Shay number 15 was built in 1913 and tips the scales at over 60 tons. The second engine, Shay number 10, was built in 1928 and weighs in at more than 83 tons. It remains the heaviest narrow-guage Shay locomotive currently in operation. Even the passenger cars have history to them, as they are renovated lumber haulers. People have a lot of fun as well on the tours. In addition to the regular rides offered each day, Sugar Pine Railroad offers a weekly special Moonlight Tour on Saturday nights. Guests take a special sunset ride on the train, and at the midpoint stop for entertainment. Prior to the run, they are treated to a barbecue dinner grilled right on site. �We have a lot of people who take the tour on Saturday, and the when they hear about the Moonlight run they come back that same day and enjoy that too,� said Stauffer. To learn more about the Yosemite Mountain Sugar Pine Railroad, including schedules, pricing and more, go to their website at www.ymsprr.com, or become a fan on Facebook by searching Yosemite Mountain Sugar Pine Railroad. �KL is definitely a great haven for events such as this. We have established our name globally in the field of F1 racing and are now looking to broaden the scope of events and activities that are available for locals and tourists alike.� said Datuk Seri Ahmad Fuad, Mayor of Kuala Lumpur. Perhaps one the most exciting circuits in the world, Sepang International Circuit will play host to Round 3 of the FIA Formula One Grand Prix World Championship in 2010. This year marks the 12th edition of F1 at Sepang International Circuit and the 7th edition of Kuala Lumpur Grand Prix City Festival. This F1 season will be the most exciting yet, with the return of what some say is the best driver in the world, Michael Schumacher. And that�s not all; he is joined by world champions, Jenson Button, Lewis Hamilton and Fernando Alonso in their quest for this year�s championship. Spectators will not only witness the one of the world�s hottest F1 race, but their sensors will be overcharged with the 2010 Malaysian Grand Prix Concert featuring famous international artists like Wycleaf Jean and Fatboy Slim right after the race. Slated for a big roar this year, the Kuala Lumpur Grand Prix (KLGP) festival 2010 is set to unveil the best of its stripes as it continues to showcase the paramount of Kuala Lumpur (KL) lifestyle with a host of heart pounding events. This renowned festival, which runs from March 16 to April 4, is an annual hallmark for the city�s calendar of top-notch red carpet affairs held in conjunction with the Malaysian Formula One Grand Prix. This year, the festival�s curtains go up with the unveiling of a host of enchanting events starting with the showcase of the 8th Vintage & Classic Car Concourse on March 27. For vintage and classic automobile enthusiasts, the afternoon promises nothing but a special treat as only the finest cars make the cut. Lionel Richie, the renowned American pop star, is scheduled to take on the stage at the Malaysian Petronas F1 Grand Prix Gala at the Kuala Lumpur Convention Center on April 2. Be prepared to be blown away by his power-packed vocals on classic hits like Hello, Three Times a Lady, Still, and All Night Long (All Night). Richie last performed to a full-house audience at the Petronas Malaysian Grand Prix Spring Gala in the Kuala Lumpur Convention Center in 2006. Petronas Pit Pulse promises a lineup of exciting events and activities, including an exhibition, Formula One simulator challenge, Petronas go-kart experience, and live performances by local artists. The excitement continues with the opening of KLGP City Festival presenting Gilded Garage Gala in the evening, featuring not only a star studded list of celebrities, fashionistas, and industry movers, but also Mercedes GP Petronas drivers Micheal Schumacher and Nico Rosberg. Right in the city center, Pavilion KL hosts the Ultimate Pitstop Festival where fashion, dining, and glamour converge into a high-octane F1 celebration. For F1 fanatics, be sure to check out the Cars Pit Stop featuring an exhibition of F1 classic racing cars as well as a showcase by Lotus Racing on the birth of the Malaysian F1 racing team where its drivers Jarno Trulli and Heikki Kovalainan will make a special appearance. Of course, in all that excitement, one cannot forget the staging of Malaysia�s premier fashion extravaganza � the STYLO Fashion Grand Prix 2010. This year, the glitzy event will feature spectacular knee-trembling fashion entertainment for 9 days from March 26 through to April 3 and will be held in several locations within Kuala Lumpur. Themed �Fashion to Art and Art to Fashion�, top Malaysian artists, fashion and accessories designers, hair and make-up artists come together in one of the most unique creative collaborations the world has seen. Giant sculptures masquerading in theme and measuring 5 to 20 feet will line the streets of Kuala Lumpur and the Pavilion in complete style. For a sumptuous gastronomical experience, the Dining Pit Stop offers a vast selection of choices to feast and fete from. Fear not for those who prefer the thrill of shopping to that of the tracks, great discounts and specials will be available from March 6 to April 11 at the GP Sale. Adding finest color and culture to the KLGP Festival is the Formula 1Malaysian Cultural Festival. Held for the first time, visitors and F1 spectators can witness the best of Malaysian culture featuring Malay, Chinese, Indian and East Malaysian cultural performances. For more information on these exciting events, please visit website www.tourism.gov.my.